October | 2006 | Who's a Daddy! I came back from three weeks of trekking in Nepal (and taking a break from baby duties) to discover my son had learnt to stand, just like that. Now everything has changed. He’s also getting pretty good at crawling. The time has come to put treasured or dangerous objects out of reach. He learns quickly, and never falls because he’s figured out that you need to hold on fast to something, which can be pretty painful for daddy if it happens to be the hairs on my legs! He stands up to get a better view and to get his hands on more items. Standing up was a natural progression out of necessity to fuel his insatiable thirst to explore, touch, hold and bit on new things. There simply aren’t enough nicknaks in the house to keep his inquisitive little mind satisfied. Now that he can stand up he can also propel himself cautiously but determinedly around the room, leaning on furniture and moving from one chair, coffee table or sofa to the next. Along the way he creates a path of devastation pulling books off tables, destroying newspapers, toppling small plants and dislodging things. It’s nightmare to clean up afterwards, but I guess he’s having fun and learning. Straightaway we had to systematically go through the living area and remove valuables to higher ground, while also removing objects that are sharp or small enough to choke on. 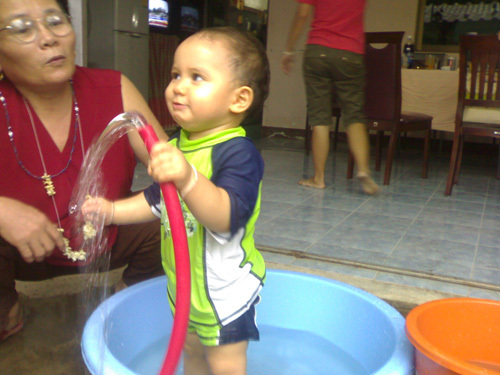 Babies have no ability to distinguish and will grab everything, learning by danger. As a new parent this is one of the milestones in lifestyle change, and it does present all sorts of potentially fatal situations as little fingers can now get caught in drawers and doors, plug sockets need to be sealed and items that can fall on him or her when pulled, have to be secured. Once your baby starts to crawl, it’s all over they say. Suddenly he’s much more mobile and no sooner can he crawl, he learns to pull himself up and stand. Well, Luka learnt that trick long ago, put the two together and he now has access to every imaginable thing in the living room below two and half feet. Now is the time to start putting things away. Ornaments, coffee table books, electrical appliances, heavy items they can pull down onto themselves, pot plants they can be ‘picked to pieces’ and so on. The other big hazard of course, is the stairs. Babies just love climbing stairs. In fact they take any opportunity they can to get off the boring old ground and witness the world from an adults point of view. It’s far more exciting up there! So, before you know it, they’re climbing the stairs and you’re climbing the bleeding walls trying to keep an eye on them. “Where’s Luka” my wife asked the other day,”I thought you were keeping an eye on him?” Yes I am dear, he’s in the living room somewhere. “No he’s not”. Turns out he’d climbed almost to the top of the stairs! Although, watching him climb, this isn’t as risky as it seems because his weight is usually forward and he seldom turns around, but the consequences if he tumbles down is severe. Luckily our steps aren’t steep, but there is the chance he’ll cling on to the banister struts and fall through. Babies are capable of getting themselves into the most unusual risks. Of course, when we caught up with him, he grinned as if he thought he was ever so clever! He’s a confident young man and I don’t want to spoil that, and he loves exploring, so I just linger behind him and let him climb, he’s done it dozens of times and feels a great sense of achievement when he reaches the top. You can see that he appreciates the conquest – maybe he’ll take to mountaineering later. Never once has he slipped or tetered dangerously, but I’m always keeping an eye on him. Now we’ve installed a gate to stop him climbing by himself, as we like to leave him free to crawl about the room and explore. We’ve also bought a bunch of ‘plug sealers’ to prevent him shoving something conducting into them. He’s intrigued now by things you can shove in and out – such as straws and tetrapaks. It’s all a big learning experience full of hazards I guess. I don’t want to cramp his style though!